A complete innovation - merging 8 bikes into 1! Nowadays parents more and more often look for smart investments, things that don't have to be replaced over and over again because children outgrow them. Well, Leg&Go is most certainly one of those sustainable purchases. 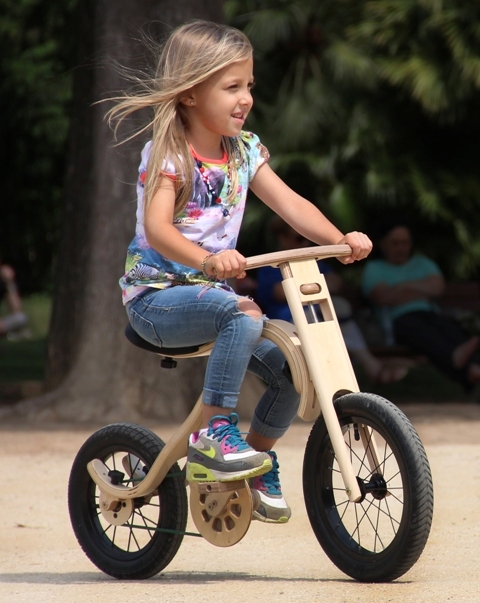 This children's bike has 8 different modifications giving additional support for learning to walk, improving the feeling of balance and enabling an option for pedaling! 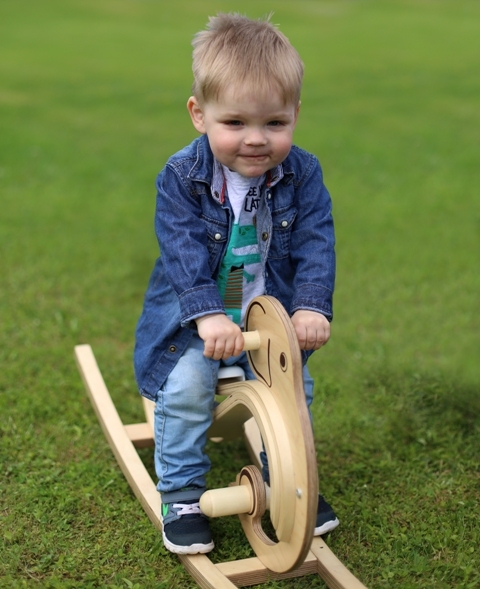 Your child from the age of 8 months to 6 years can enjoy the freedom of rocking and riding on one safe and harmless toy. In addition to various versions, Leg&Go is also safe. Its unique frame design provides incredible suspension travel absorbing shock and safeguarding your child’s spine. 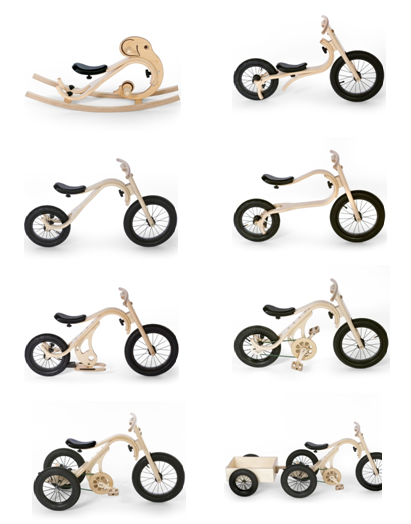 The frame is unique not only because of the suspension, but also its angles are developed so that the frame automatically shifts the shock from saddle to wheels. And Leg&Go has a better steering mechanism with readjustable steering limiter and bigger front wheel for more precise steering. For more comfort, each of Leg&Go versions can be adjusted to your child's ever growing height. Being flexible in size, it allows each child to master balance at their own pace and start pedaling with complete confidence and reduced risk of falling. 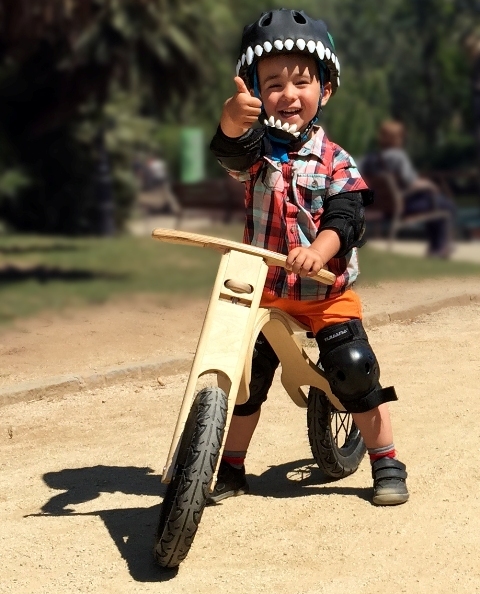 With regard to loosing balance, Leg&Go bike being made from wood has a quality that metal bikes don't – wood takes on a part from hit, preventing or significantly reducing the severity of injury. The birch plywood used gives an elegant and eco-friendly look, as well as allows the perfect thickness for maximum flexibility and durability. The use of each Leg&Go part has been carefully thought through, which is why it has alloy rim, steel spokes, wider polyurethane saddle, belt instead of a chain and the best fitting mechanisms for pedaling.